He was the slightly older guy next door with those smoldering eyes that made me weak and the sideways grin that made me melt. Jason is trouble. Jason is no good. Jason will only break your heart. So I listened. It’s not like he would have wanted me anyway. He never saw me as more than the girl next door, the prom queen with her nose in the books. Yeah…I went from prom queen to beauty queen. A literal, real-life, perfect smiling pageant doll, and I’m about to be kicked out of the contest. So I ask Jason to do something crazy – pose as my fiancé to help me look like the picture-perfect, wholesome beauty queen with a gorgeous man on my arm. Because the way he looks at me with that intensity in his eyes, the way he touches me with that heat behind his skin, the way he knows every single detail about me is very real. Jason Anderson is supposed to help me with my wholesome image, but he’s about to see just how un-wholesome I can get around him. 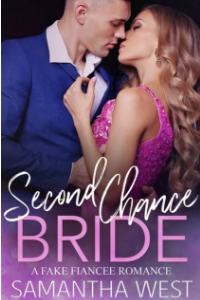 Second Chance Bride is a fun, steamy, stand-alone full-length novel with no cheating and an HEA.